Saturday night, I was baking muffins. I was planning to make a pie for dessert when I realized that I didn't have the key ingredient for the pie I wanted to make. The Pilot said, "Why don't you make chocolate chip cookies." I have about a dozen chocolate chip cookie recipes on Pinterest that I've been dying to try so I sent The Pilot to Pinterest to peruse chocolate chip cookie recipes. We only had about 2 1/2 cups of flour left in the pantry so that limited us a bit, but after 3 tries, we settled on these from Oh, Ladycakes. After perusing her blog, I now want to cook my way through it. Now, Oh, Ladycakes is a vegan blogger, and I have thoroughly un-veganized her original recipe. I mentioned yesterday that I made a little bit of a mistake in the kitchen in making these cookies that turned out to be one of the greatest mistakes I've ever made. It really wasn't that dramatic and it really wasn't a mistake. First, the ingredients. (For the *probably* healthier, vegan recipe, click over to the original recipe). Now, here's what happened. My brown sugar was hard as a rock. I knew this before we decided to make chocolate chip cookies. I had recently seen something online that said that if you put the brown sugar in a bowl, cover it with a wet paper towel, and microwave it, it would magically become soft again. Well, it became soft again. It completely melted. It was this gorgeous wet sand looking mess of sugar in a bowl and I looked at The Pilot and said, I'll take it. And that my friends, yielded the most decadent chocolate chip cookies I have ever made. Oh Ladycakes says that the secret is in letting the dough sit in the refrigerator overnight so the sugar to completely dissolve. Well, something about that already dissolved sugary goodness sitting in the dough overnight just made for these cookies to be heaven. In a mixer, beat the butter on medium speed until creamy. While the butter is mixing, pour the brown sugar into a microwave safe bowl. Cover with a damp paper towel and microwave in 20 second instruments until brown sugar melts. You may have to stir it after each 20 second increment. Add sugar and vanilla to butter, continue to mix for 1 minute. Add the egg, mix until just combined. Add baking soda, baking powder, salt and flour. Mix until thoroughly combined. Add chocolate chips and mix until evenly distributed. Cover the dough with plastic and stick it in the freezer overnight. When you're ready to bake, preheat the oven to 350. Scoop the cookies onto a baking sheet lined with parchment paper and sprinkle with sea salt. Pop the cookies in the freezer for approximately 10 minutes. Bake for 10 minutes, allow to cool for 5 minutes before transferring to a cooling rack. They probably would have been just a tad too sweet if we hadn't sprinkled sea salt all over the tops of them. So, there you have it. I will never make cookies the same way again...or anything that requires brown sugar for that matter. Tell Me: What's the best kitchen mistake you've ever made? Uhhh these sound AMAZING!!! I totally need to try that with brown sugar now!! 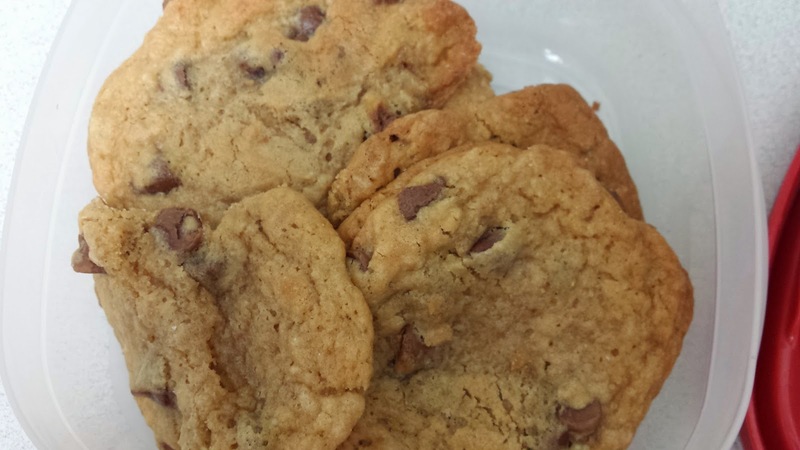 Nice to share the chocolate chip cookie recipes with us . Day before yesterday I had online shopped at kohls free shipping code and win a free recipe of baking chocolate chip cookie and I had applied it in my home its awesome.